Are you getting the most out of your business IT system? Are you constantly having computer problems that slow down your production? You need a computer support system that works for you. You need Lithic. At Lithic, we organize your overall systems network to ensure that it works efficiently and effectively. You need a network that can accommodate the needs of your business as it grows. Our goal is to take care of your IT issues, so that you can spend your time doing what you do best. After all, time is money. At Lithic IT, we are the Human I.T. Why do we call it that? Because we understand that, even when it comes to technology, it all boils down to a personal relationship. With Lithic, you have a dedicated account manager who knows your business and works with you directly. We pride ourselves on responsiveness and competence. From HIPPA technology compliance to everyday support, there is no system to complex or network too small. 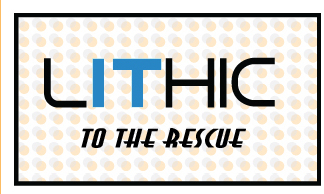 Lithic is your one stop resource for technology for less than a part time employeee would cost your business each year. Contact us today and start focusing on your business and not your technology. get back to you with a solution.